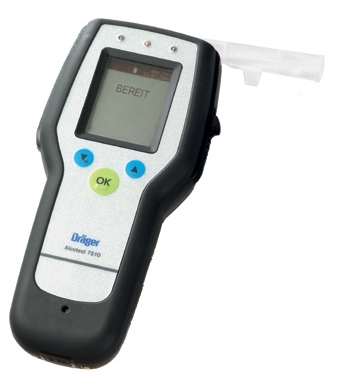 The Drager Alcotest 7510 represents the market's most advanced evidential breath tester. It is specifically designed for Law-Enforcement's road-side screening and evidential breath test applications in conjunction with the Drager Mobile Printer. The Alcotest 7510 is NHTSA certified as an EBT and will most likely become the first handheld EC based breath testing device compliant with OIML. ADVANCED TECHNOLOGY - The latest in Draeger sensor technology, the Draeger Alcotest 7510 ensures fast, precise measurements. A built-in heating element prevents condensation and ensures quick and accurate measurements even at sub-freezing temperatures. Draeger's Fuel-Cell is alcohol specific and assures unsurpassed reaction and recovery performance. "TRANSFLECTIVE" DISPLAY - The device incorporates an innovative transflective, high-resolution graphic LC display. The backlit display provides clear, unabbreviated, selectable multi- language text messages ensuring legibility in bright sunlight as well as total darkness. In addition, three light emitting diodes (LEDs) support the information displayed. MOUTHALCOHOL DETECTION - The Alcotest 7510 represents the first handheld EBT capable of detecting mouthalcohol! This technological advancement is made possible through the employment of a piezo-electric activator as part of this new sampling system. ABSOLUTE PRESSURE MONITORING - The Alcotest 7510 employs an absolute pressure transducer. This sensor will automatically compensate for the effects of atmospheric pressure changes when using dry-gas standards for accuracy verifications and calibration procedures. GPS TECHNOLOGY - The Alcotest 7510 incorporates a GPS module recognizing the exact geographical location where a breath test is performed. Uploading these coordinates to a central computer, the administrator has the ability to establish a map showing the DUIarrest- density. Furthermore, this technology allows for precise determination of where the test was conducted for possible administrative processing of a specific DUI stop. MOUTHPIECE EJECTION - Designed for maximum hygienic protection, the Alcotest 7510 features a mouthpiece ejection system. MOUTHPIECE SADDLE LIGHT - For easier insertion of the mouthpiece in darkness, a blue positioning light allows for prompt mouthpiece placement piece ejection system. WIRELESS PRINTER INTERFACE - The Alcotest 7510 is equipped with an infrared communication interface allowing wireless data transfer from the breath tester to the printer. DATA STORAGE AND COMMUNICATION - The Alcotest 7510 can store virtually thousands of test data including all the test results with date and time stamps, GPS coordinates, subject and officer data, violation code, etc. The memorized data can be forwarded via the Draeger Mobile Printer to a remote host PC by use of either a Modem or Ethernet communication link.